An exploration of the ambiguous line between absence and presence in Words, Film and Music. A novelist born in Amoudah, Syria in 1978, Haitham Hussein currently lives in London. He worked as an Arabic language teacher before leaving Syria in 2012. He has lived in UAE, Lebanon, Egypt, and Turkey. Hussein writes articles for several Arab periodicals and magazines and has a weekly column in Al Arab Newspaper issued in London. He is a member of the Society of Authors in Britain, Scottish PEN Club, and the Syrian Writers Association. His novel Hostages of Sin was translated into Czech by Yana Bergiska and published in Prague in 2016. His published novels include Aram – Descendant of Sorrows, Hostages of Sin and Horror Needle. is a London based Rubab player, composer and music producer working in contemporary Afghan folk, world jazz and fusion music and promoting the precious sounds of Afghan’s musical traditions. He has performed at the Houses of Parliament, the British Museum, the White House, Victoria and Albert Museum, Festival Hall amongst others. He has composed for BBC programmes as well as for a number of films and theatre productions. 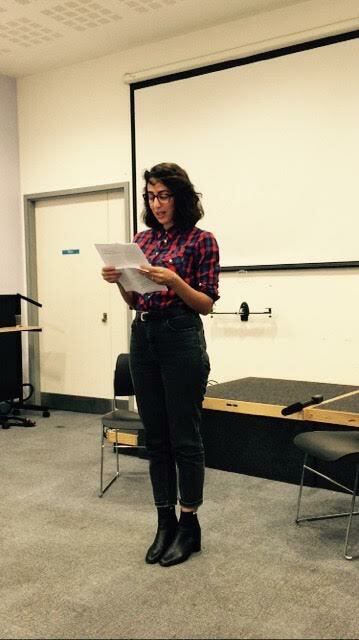 Farrah Akbik is a British Syrian poet based in London. She has performed her poetry to raise awareness of the plight of Syrian refugees. was born in Baghdad, studied cinematography in Budapest and worked in the Hungarian film and television industry before relocating to London. He is now an independent prize-winning film-maker based between London and Baghdad. He has directed and produced his own films with his first feature film being‘Leaving Baghdad’. Other films are ‘Still Life’. ‘Wasteland’,Baghdad Correspondent’, ‘Against the Light’, 7 Days with Gypsies’. The main themes in al-Janabi’s work are displacement, alienation and exile. is a British Syrian published poet and writer of Kurdish origin who lives in London. He will read from his forthcoming collection Dear Refugee to be published in 2019 (Smokestack). His previous work is Don’t Forget the Couscous (Smokestack 2015) and From Aleppo Without Love(2017).